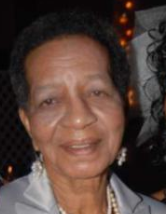 Funeral service for Mernelle Baxter will be held 12:00 p.m. Saturday, January 26, 2019, at Purcell Funeral Home, Laurinburg. Burial will take place in the McLaughlin Cemetery Raeford, North Carolina. Viewing and visitation will be held Friday, January 25, 2019, from 3:00 until 6:00 p.m. at Purcell Funeral Home. Services are entrusted to Purcell Funeral Home, Laurinburg. Mary “Mernelle” McLaughlin Baxter was born on October 27, 1934, in Raeford, North Carolina. She was the oldest of seven children born to the late Edward “Mason” McLaughlin Sr. and Mary “Elma” (Evans) McLaughlin. Mernelle was educated in the Hoke County Public School System in Raeford, North Carolina where she graduated in 1951 from Upchurch High. After graduation, she attended North Carolina AT&T. Mernelle married the late George Marshall Sinclair. From this union, they were blessed with one beloved daughter Cora Nadine Sinclair who preceded her in death. Mernelle moved to Washington DC, where she continued her education at Mary Washington Nursing School and became a Licensed Practical Nurse where she practiced nursing for many years. Early in life Mernelle became a believer of our Lord Jesus Christ, marking the beginning of a lifelong dedicated service to Christ and the Church. She had a love and gift of crocheting. This gift led to many requests for hats, scarves, blankets, and beautiful crocheted dolls. Mernelle truly LOVED her family. She took great joy in cooking them their favorite foods, which didn’t always look so appetizing, but we all know looks are deceiving. Her food was Mmm Mmm Good! Just ask her brother Worth to tell you the story about the “UGLY” Potato Salad. She moved back to Raeford, North Caroline to care for her mother, and later became employed with the City of Hoke County. Mernelle was preceded in death by her parents, Mason and Elma McLaughlin, her beloved daughter, Cora Nadine Sinclair, her husband, Jack Baxter, sister, Australia Burell, brothers, Edward Mason McLaughlin Jr., John “Carlette” McLaughlin, and Frank Purcell, brothers-in-law, Amos Coleman, and James Robert Daniels Sr.
Mernelle peacefully departed this life on Wednesday, January 16, 2019. She leaves to cherish her memories: her sisters, Themeta “Hazelle” Coleman, Elma Oneita Gilchrist (Jim), Geraldine Daniels; brother, William Worth McLaughlin Sr.; ten beloved grandchildren, Michael Shaw Jr., Letitia Sinclair, Marshall Sinclair (Rickea), Marcellus Sinclair, Donald Sinclair, Dalonte Sinclair, Shalonte Napper, Brittany Napper, Angel Sinclair, Heaven Barnes; Fifteen great-grands, four great-great grands; two god-daughters, Elaine Allen, and Helen Miles; one god-son, John Southerland “Bodie”(He affectionately called her Ms. Nell), a special cousin & friend, Walter Purcell; and a host of beloved nieces, nephews, relatives, and friends. She will be sadly missed.